I left Alice Springs on June 3rd to spend a few days at a cattle station about 100kms north west of there where Al, one of the happy campers at The Gap View Hotel, was off to work 6 months as manager. What a great experience that was! Just to be on a 1 million acre property was unbelievable, but I also had the opportunity to go out on a bore run one day. The bore run was about 170 kms checking the cattle, the water troughs, the pumps and the tanks at different places around the property. As Al had not long been there he was also finding his way and setting himself up for the longer haul. There was an established vegetable garden there but we also planted seeds for silverbeet, lettuce, onions and carrots to keep the supplies flowing. Unfortunately I wasn’t there long enough to see any little shoots come through but I am getting progress reports when the seedlings are bursting through the soil. Before I got too comfortable feeding the chooks and watering the plants I was heading north again. A quick stopover at the Ti-Tree roadhouse overnight and I was on my way to the Devil’s Marbles. 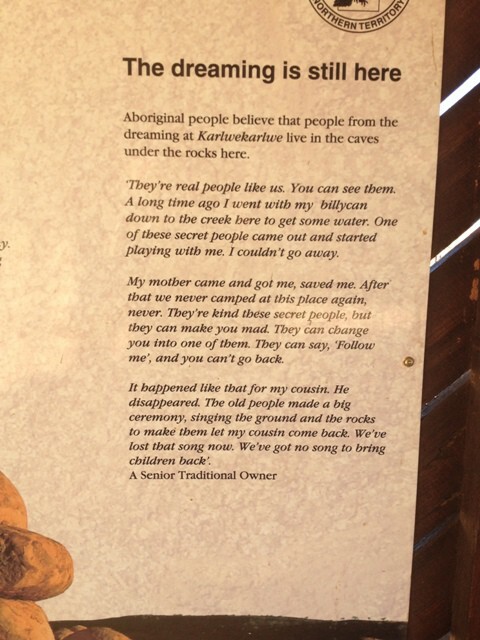 I really enjoy reading the traditional owners stories about some of these areas so I’m sharing this one with you. The Devil’s Marbles themselves were awe inspiring, as is so much of the landscape in Central Australia. Not far from here there are also The Pebbles, not quite as spectacular but once again an important place in indigenous culture. The Pebbles are a women’s meeting place and men have to ask permission to travel through this area. I drove through Tennant Creek – everything closed due to a Public Holiday – a finally caught up with Nev and Margaret again at Banka Banka station – green grass, campfire at night and great company. It was only a quick catch up though as I decided to brave the 11kms of corrugated dirt road and go in to the Longreach Waterhole, just out of Elliot. What a great choice this was, and what a shame the others missed it. Although corrugated, the road in wasn’t too bad and the destination certainly made up for any shaking around. I had 3 lovely days and nights here, right on the waters edge, surrounded by wonderful bird life. I’m trailing the others yet again with no hope of catching up so I’m taking my time, with my next stop the iconic Daly Waters Pub. Camping was inexpensive at $14 for a powered site for one person, (love the sign on the power box), so I lashed out for 2 nights, hooked up my power, did my washing, and of course had the famous Beef and Barra meal. I passed on the beef and just had barramundi but whether you ate here or not the pub itself was an experience and a half…. Only 100 kms to Katherine, so I’m on the home stretch for this leg of my travels. I stayed at the reasonably priced Ibis caravan park, met the ‘local’ residents, swam in the Katherine thermal pool, went to the local club to watch the second State of Origin (Rugby League), stocked up my pantry, filled up my petrol tank and I’m ready to hit the road again! I’ve now been in Katherine for four days but tomorrow, June 19th, I’m on the move again In the last 16 days I’ve travelled just under 1200kms. I’m now heading west to attempt to catch up with Nev and Margaret yet again. Who knows if it will ever happen….I really feel like I’m living up to my blog name and byline – the Snail Trail – in no hurry to get anywhere! Categories: Australia, Camping, Travelling | Tags: Aileron, Alice Springs, Banka Banka, campervans and motorhomes, camping, Daly Waters, Katherine, Longreach Waterhole, Mataranka, thermal springs, Ti-Tree | Permalink. Thanks Jan. Glad to stir up good memories for you while I’m out creating my own! I have been following your travels and am enjoying it very much. 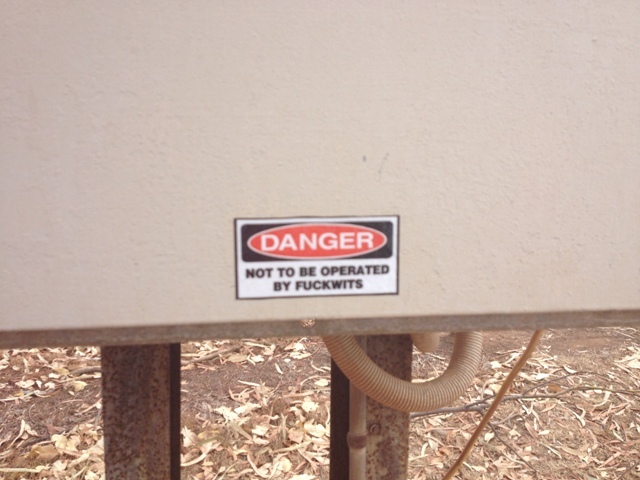 I did he trip to Darwin last year but missed out on some of your adventures. Keep the story coming please. I’m glad you’re enjoying my trip…thanks for coming along with me! So great to read your blogs and see your photos- what a time you are having and the places and sights you are seeing- have you written any ore bush poetry of late? I tuned out of your blog for a while – too much work and getting ready for another trip. So reading your latest blog is just the ticket to get the travel juices exclited. 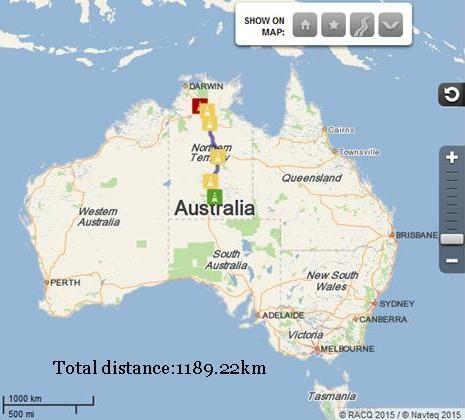 I did this trip (up centre & into WA) last year and looking forward to heading off on the same route in August. Longreach waterhole sounds like a great option – missed that last time. Ps is it complicated to add a map to your blog?